Amador Bustos, a longtime West Coast broadcaster, has built three radio companies from scratch in two different centuries. The first in the early 90’s, Z-Spanish Radio Network, merged with Entravision in 2000 as part of the New York Stock Exchange’s biggest media public offering that year. The second ended during the Great Recession of 2010. After reaching an agreement with its lenders to exit, Bustos regroup to rebuild Bustos Media Holdings, LLC and move its headquartered to Portland, Oregon. Over the last eight years he has grown the company to 21 stations serving markets mainly in Oregon and Washington. Perhaps more than anything, Amador Bustos’s success in radio can be attributed to one thing: he understands the power and growth of ethnic communities and what radio means to them. 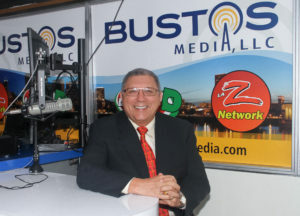 Bustos Media, where Mr. Bustos is president and CEO, is providing multilingual radio services to Spanish and Russian-language communities in the Portland metro area. Bustos Media has also diversified programming for Spanish listeners, offering the community not only music, but religious and talk format programming. Musical artists’ managers have taken note of radio’s popularity with Portland listeners. Bustos said artists’ representatives and managers approach Bustos Media nearly every day to ask for airplay for their artists’ music. “They know radio is still the primary channel for the discovery of new music and the most powerful vehicle for the success of their public performances,” Bustos said. For established artists, Bustos Media actively promotes their market tours. For up-and-coming artists, Bustos Media hosts VIP performances and listening parties at various nightclubs and festivals around town to get them recognition. “There is no better promotion for artists than getting themselves in front of large radio audiences,” Bustos said. When it comes to a performance tax on radio, proposed by some record labels, Bustos told the Free Radio Alliance the tax was unwarranted. “The reciprocal benefit has worked for decades. There is no need for an additional tax or fee. Artists are compensated with the airplay they receive.” He said, artists now often put their own money behind promoting their new releases and give the radio audiences significant prizes and VIP trips to their concerts.